Thoughtfully organized to maximize enjoyment, this sci-fi collection introduces YA readers to exciting subgenres and authors. 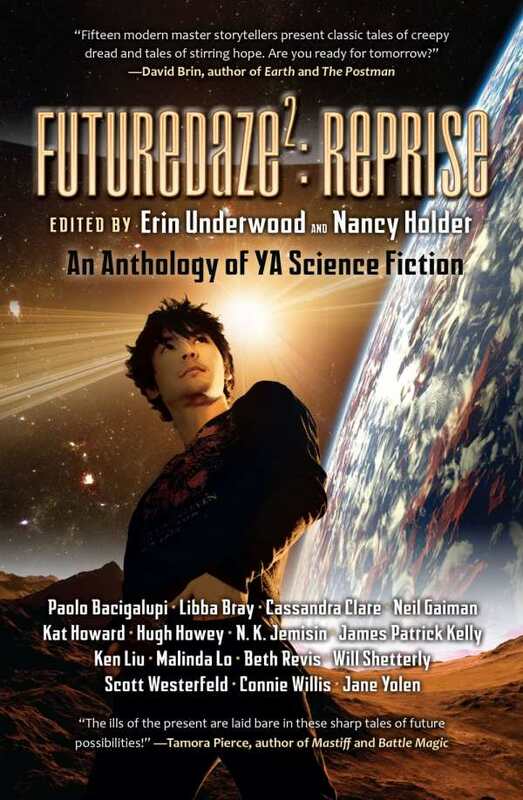 Underwood and Holder follow up Futuredaze, their collection of original science-fiction stories and poetry, with this sequel featuring fifteen previously published stories by well-known YA authors like Scott Westerfield and Cassandra Clare. The editors aim to inspire their teen audience “to go boldly where no YA has gone before.” With this skillfully arranged anthology, they have charted an intriguing journey through the landscape of contemporary YA science fiction, and this will expose fans of its bestselling series (like Divergent and Mortal Instruments) to new authors and subgenres in the field. The opening and closing stories are written by two of the hottest authors represented in the anthology, Neil Gaiman and Cassandra Clare. There is a good balance between better-known modern sci-fi stories, like Gaiman’s “How to Talk to Girls at Parties,” from his collection Fragile Things, or Jane Yolen’s “Wilding,” and stories that are part of the recent landscape of steampunk, dystopian, and other specially themed anthologies. Longer stories are balanced by shorter pieces, like “Sweet Sixteen,” which explores the balance between personal choice and society’s needs in a six-page window into the life of one girl about to choose her destiny. The editors’ respect for their teen audience is apparent and adds to the appeal of the collection. The previously mentioned stories, like all of the others chosen for this book, incorporate issues of identity, independence, and relationships that are hallmarks of YA literature. “Valedictorian” and “Stupid Perfect World” take place in school environments, a setting that lends some familiarity to the futuristic worlds their characters inhabit. Diversity in gender and race is reflected in both the contributing authors and the characters that inhabit the worlds they have created. One of the best examples of culture blending is “The Veiled Shanghai,” in which author Liu reimagines The Wizard of Oz in an alternate China, merging the mythology of Oz with Chinese history. The design of the book will attract teen audiences. At just under 300 pages, the length provides a nice taste of some of the best science-fiction writing for teens without being overwhelmingly long. Eye-catching cover art includes the names of the authors with stories in the anthology, adding crossover appeal for adult science-fiction fans, who will recognize many of them.